Long before we turned our collective hate upon Larry Hagman's machinations as JR Ewing in Dallas, ITV and producer-writer Wilfred Greatorex were thrilling British audiences with the power politics and boardroom tussles of one John Wilder. He made his debut in the second series of The Plane Makers, an ATV made drama that chronicled the efforts of manufacturing company Scott Furlong to design and build a new passenger aircraft, the Sovereign, and sell it to international market. The series later saw the company move into the jet-fighter market too. Alas, only the pilot episode Don't Worry About Me remains from the first series made in 1963, and based on that it is clear that the series underwent a radical change in direction for the second series. 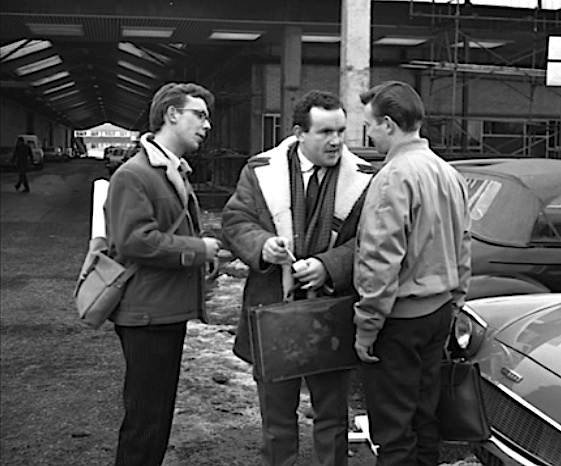 The tone of Don't Worry About Me is highly reminiscent of Karel Reisz's adaptation of Alan Sillitoe's Saturday Night And Sunday Morning in that it focuses directly on the drama of the machine shop floor, the hierarchies of an all male world of shop stewards, apprentices and dyed in the wool 'in it for themselves' working men. Colin Blakely (himself no stranger to gritty Northern kitchen sink dramas with appearances in both This Sporting Life and Saturday Night, Sunday Morning) makes an early television appearance as Jack Clement. Clement is the factory's hard case, knows all the dodges and how to cut corners to get his work done. Giving encouragement to no-one but himself Clement ends up setting a bad example to a young apprentice, Maurice (Christopher Beeny) and sours the ambitions of a young draughtsman Sammy Metcalf (Ronald Lacey). Edmund Ward's script captures that restlessness and cynicism of the working class man trapped in a factory occupation and sandwiched between trade unions, the management and younger men eager to get on. It's a fascinating peek at the factory floor politics of a now vanished British manufacturing industry. With the second series Wilfred Greatorex restructured the series format to include the glamour and in-fighting of the executive class and the boardroom at Scott Furlong. There is less focus on the bluff blue collar working class manual labourers and more sub-plots involving white collar designers, engineers and test pilots. 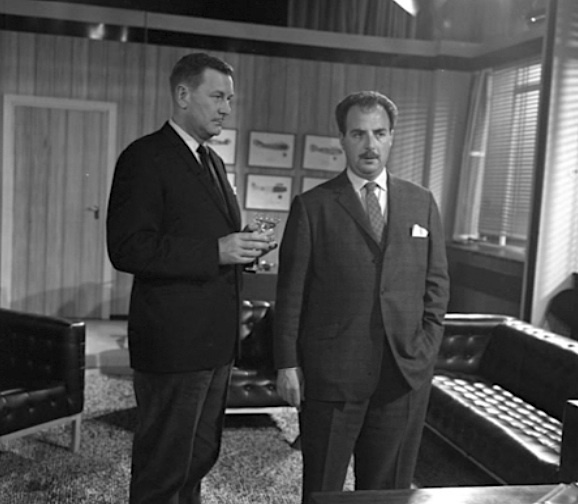 The boardroom battles and the drive to sell the Sovereign turn the series from gritty, kitchen-sink drama, which apparently ATV owner Lew Grade found rather boring, into something that better suited the faded cachet of the jet-set and their penchant for international business deals. The DVD set contains 13 of the 26 episodes from the second series with presumably the second half the series and the third series planned for Volume 2. Leading the drive into international markets is the superb Patrick Wymark as the serpentine anti-hero managing director of Scott Furlong, the bullish John Wilder. 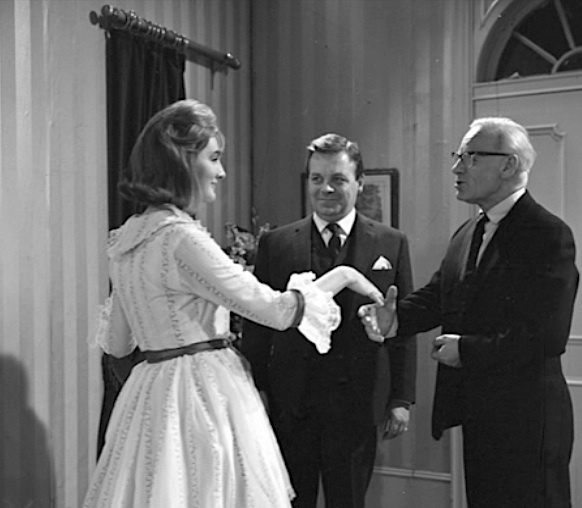 Greatorex also introduces Wilder's wife, Pamela (the equally superb Barbara Murray) and his right hand man Don Henderson (Jack Watling) and his reliable secretary Miss Lingard. 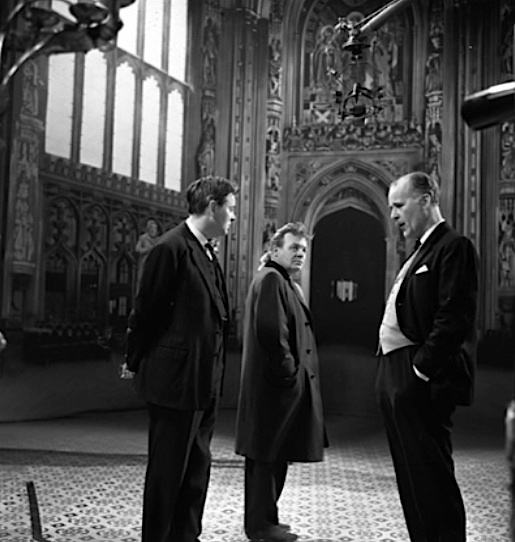 All three would be transfered to greater success in the sequel drama The Power Game in 1966. We not only see Wilder's desperate attempts to get the Sovereign into production before French rivals unveil their own aircraft but also his personal relationships with mistresses, with fellow department heads and an antagonistic board. This gets off to a great start in Too Much To Lose as Wilder pushes his team to get the plane into test flights in a matter of weeks despite warnings from his test pilot Henry Forbes (Robert Urquhart) and engineer Arthur Sugden (the wonderful Reginald Marsh). Amidst all of Wilder's irascible commander-in-chief dramatics, I adore the relationship between Arthur and his world weary secretary Margie (Elizabeth Begley). If ever there was an advert for chain-smoking then keep your eyes on Margie in this episode. She's constantly got a fag on the go, it's usually perched on her bottom lip and she delivers most of her dialogue through it and clouds of billowing ciggie smoke. Wilder is, of course, hoist by his own petard as the undercarriage of the Sovereign collapses during a test flight and he's left with a lot of explaining to do. The series then goes on to explore the paranoia of the nanny state and the surveillance society as Wilder's jumpy security chief Todd goes out of his way to root out the Communist connections of designer Gareth Edward's son in the effective Question Of Sources; bribery and corruption at executive level is shown in contrast to the manual workers little fiddles on the factory floor in All Part Of The Job, a taut script from Richard Harris. Wilder's philandering nature is much to the fore in Don't Stick Your Head Out when Arthur Sugden gets an object lesson is sales techniques on a trip to Italy and writer Edwin Ranch gets down and dirty with union culture and executive privilege in The Old Boy Network. The series has its lighter moments too. 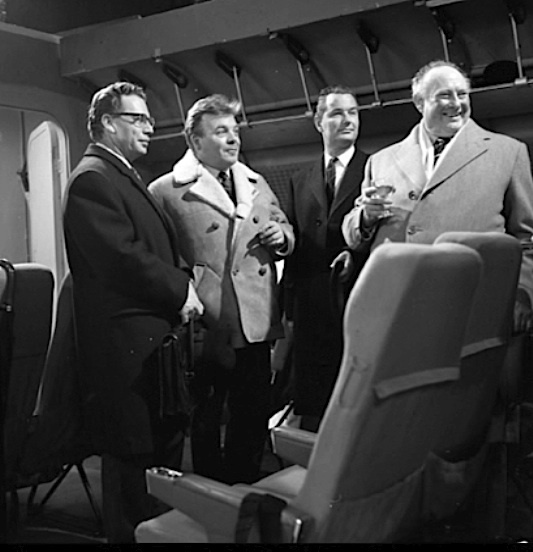 Peter Draper's Any More For The Skylark is a silly but tight little farce which examines the 'something for nothing' rivalry between workers and executives as the Sovereign test flight offers them 60 odd tickets to the Mediterranean. Victor Maddern gobbles the scenery as a rougher version of the 'nudge-nudge-wink-wink' Monty Python character and the episode also features an early television appearance from Babs Windsor, at once trying to be butch spraying paint in her overalls and goggles and then camply taking to the stage for a song and dance number. You will also spot a very young Rodney Bewes as a shy PR man who gets the girl all the fellas have been falling over backwards to impress. His challenge to Patrick Wymark's Wilder that he made a mistake in withdrawing the offer of the 60 tickets from the workers and lining them up for a load of journalists, is wonderful stuff. The series is littered with well known British character actors and comic actors - Richard Vernon, John Junkin, Sean Lynch, Tenniel Evans, Brian Murphy, Garfield Morgan and John Horsley among them - and there are some decent scripts from the likes of Peter Draper, Edmund Ward, John Finch. One of the best episodes comes from actor/writer Leslie Sands, who by this time had also joined the cast of Z Cars and went on to write a number of episodes for the series too. In A Matter Of Self Respect, we return to the machine shop floor as recovering alcoholic Tim Carter is offered a job by Arthur Sugden. What follows is a sensitive portrayal of a man who drank to face up to his unfaithful wife, who then argued with her on a car journey home, resulting in a car crash that killed her and separated him from his young daughter. Beautifully performed by Sands, his character Tim Carter gradually comes to realise that his hope of reuniting with his daughter isn't possible because he can't provide her with a stable home. Probably the highlight of this volume. There's a rather ridiculous attempt at comedy with Costigan's Rocket which basically ignores the whole plane manufacturing setting in favour of one of the workers, Costigan (who had featured in a Series One episode) acquiring a greyhound and racing it to make money for his daughter's wedding. I think you can guess the inevitable outcome. The Cat's Away is the series back on form with a story about Wilder bringing in a time and motion study and the unions fearing the loss of jobs. Trouble brews as Arthur Sugden desperately tries to race to his dying sister's side and the episode explores loyalty to the job and to your fellow workers and what we would describe as the difficulty of achieving a work/life balance. John Junkin plays Dusty Miller the union rep and is again another actor/character transferred from the first series. Strings In Whitehall is set in the more familiar setting of Whitehall that would form the backdrop to much of the later The Power Game episodes and shows that Wilder is not above lobbying MPs to get support for his drive to sell the Sovereign to international clients, one of whom he is courting with a what would be best considered a bribe. These boardroom and Whitehall set stories are an acquired taste but are interesting in that they throw some light on Wilder's business dealings and power plays, providing a good contrast to the more personal stories in the series. Patrick Wymark tends to lead the cast in these particular episodes whilst Reginald Marsh gets the personal stories that deal with the shop floor and the blue collar workers. This DVD set concludes with Best Of Friends in which one of the test pilots discovers that his wife has had a one night stand with his best friend and that he's gradually going blind and making mistakes during test flights. A gripping melodrama with an early television role for Zena Walker and again some fine support from Robert Urquhart returning as Henry Forbes as the colleague everyone goes to when they need to share their troubles. The only extras are two image galleries and a Series Two PDF. The Series One gallery is a fascinating glimpse of episodes that no longer exist including stories featuring the likes of Alfred Burke, William Hartnell, Annette Crosbie and Johnny Briggs. The second gallery has a selection of images from some of the stories from Series Two. The PDF is 60 pages of episode synopses covering all of the 26 stories that comprise the second year with cast and crew lists. Some of the second half of this series is missing so these will come in useful when Network release Volume 2. There is no restoration applied to the episodes themselves so they are a bit rough and ready and you'll need to crank up the sound as the mono soundtrack tends to be low and very hissy. All perfectly watchable drama though. 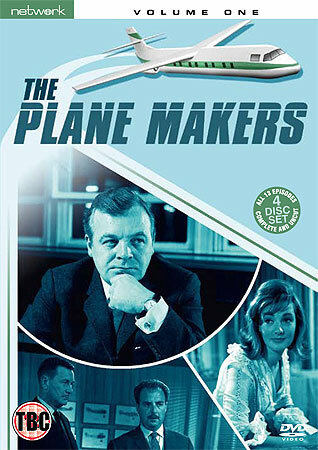 The Plane Makers - Volume One (Network DVD 7953275 - Region 2 - Released 21st June 2010 - Cert PG) Only available as a 'web exclusive' from the Network site.